It was a hot, but thankfully not humid, Father’s Day – perfect for a 2pm rematch between the defending champion Boston Whitecaps visiting the Philadelphia Spinners. The previous game was a one-point thriller, despite Boston fielding a skeleton squad. This time, Boston carried a few more players but were still without at least one of their superstars in Danny Clark. Philadelphia, meanwhile, was down some stars of their own by missing breakout star Patrick Diviny on offense and layout machine Frederik Brasz on defense. Philadelphia, PA: Arthur Shull (Philadelphia Spinners #16) makes a catch as Jeremy Nixon (Boston Whitecaps #9) defends at the Major League Ultimate game between the Philadelphia Spinners and Boston Whitecaps, Sunday June 15, 2014. Check out both the Highlights and Full Coverage galleries from me and Brian Canniff! 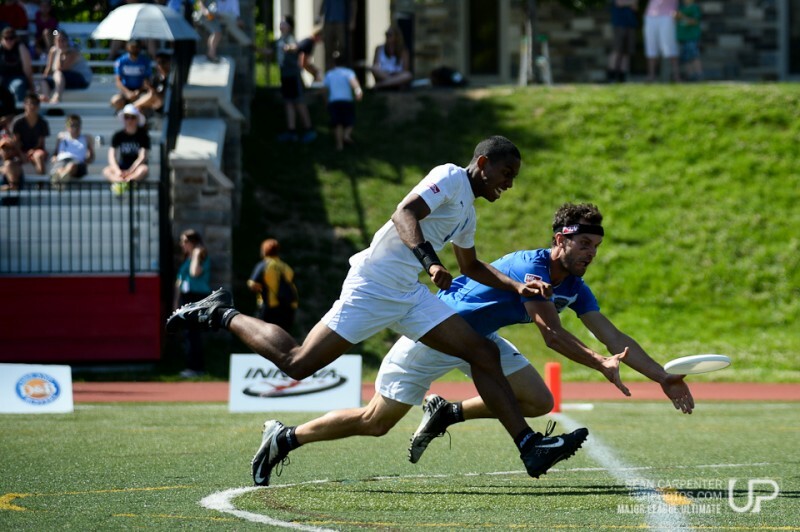 Remember, purchases start at just $3 and help support our awesome UltiPhotos coverage!